Living in the weather can be interesting. Late last August, we were hit by a freak windstorm. 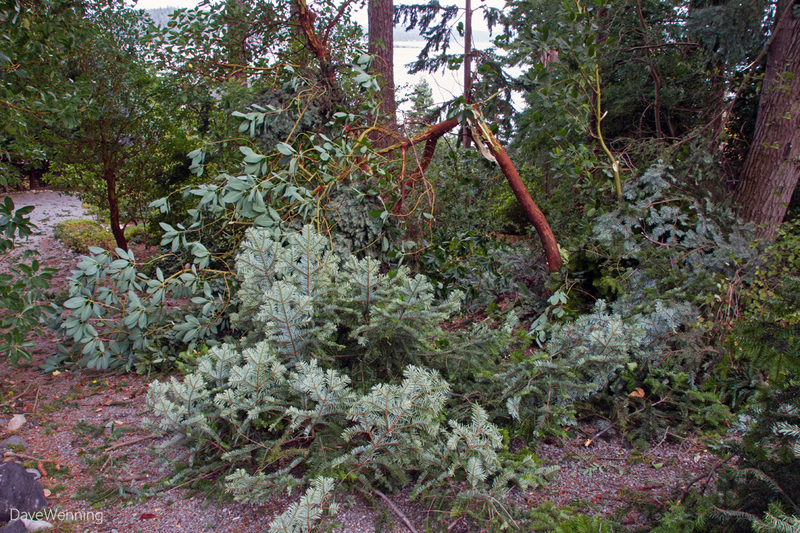 A sudden gust of wind from the west snapped off a couple of the neighbors' tall Douglas Firs. Those firs landed in my driveway and upper garden. They snapped off one of the Madronas that line the driveway (near the center of the photo with red trunk). Pacific Madronas (Arbutus menziesii) are nifty trees that don't grow just anywhere. They are nearly impossible to transplant. I felt bad to lose one of the big ones. I was left with a four foot high stump without any foliage. I had the tree service cut it off at the ground level when they cleaned up the firs. The other day when I went up for the mail, something at the edge of the driveway caught my eye (first photo). 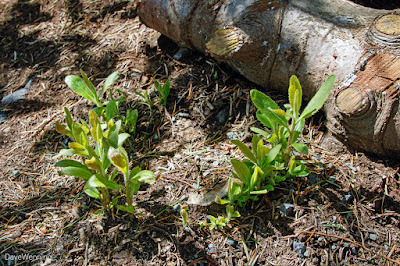 That cut off Madrona is growing new shoots from the margin of the cut end. For a fussy tree that is difficult to grow, this is indeed a miracle. Apparently, if they like the spot, neither tempests nor chainsaws can stop them. This might provide a lesson for how to grow them. When the house was constructed, the driveway was built up with pit run stones topped with road fill and crushed rock. The pit run ranged from large gravel shards to bread loaf size. This is the medium in which the Madronas chose to grow. Now that I think about it, this would be much like the pure stone where they grow on Goose Rock in Deception Pass State Park. 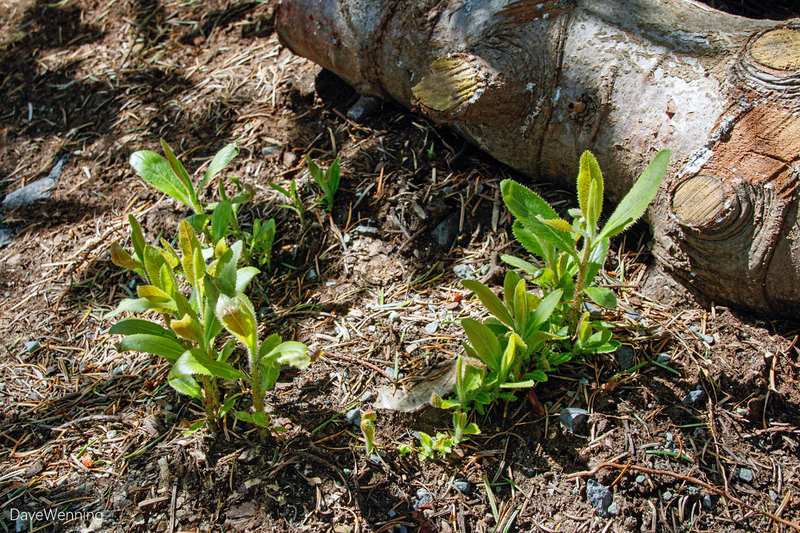 For now, I will leave the new shoots alone and see how they come along. Eventually, I will leave only two or three of the strongest. The tagline of this blog is "Living in the weather..." This story provides a good example of what that means. I love this! Madronas are such a special tree. They have fond associations for me from seeing them along the slopes above the beach at my grandparent's home just a few houses north from the Brown's Point Lighthouse. I'd say madronas and western red cedar are my two "totem" trees - so evocative with the Puget Sound region/upper left USA. That's wonderful that tree has sent up shoots - I hope it grows and thrives. BTW was hiking around Bowman Bay yesterday with a group,hope to come back and go see the rhodies with you, perhaps next week? Will check to see if you are leading hikes.